For all of our latest updates click here to see our winter newsletter. Check out the most recent research paper that W4C commissioned which provides a current review of gender-specific issues faced by women and girls in Hamilton at all stages in life. What is Women 4 Change? Women 4 Change was established in 2012 by a group of local women who came together with HCF in a mission to inspire and enable the women of Hamilton to become leaders in philanthropy, while improving the lives of women and girls in our community through collective giving. 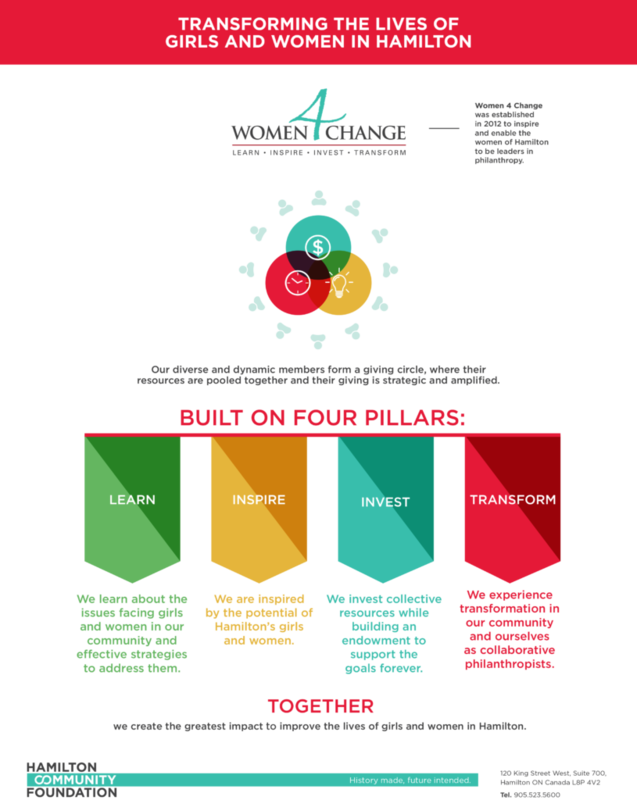 The founders of Women 4 Change envisioned an initiative where contributors would work collaboratively to achieve transformational change. They established a field of interest fund at Hamilton Community Foundation, to which each person contributes annually, as the vehicle through which annual grants to local organizations will be made. Throughout the year a number of educational and social opportunities are provided to enable contributors to learn about philanthropy and the issues they care about. They have established guiding principles to ensure the Women 4 Change initiative grows and develops in a meaningful and informed way. How will we make a difference? Women 4 Change’s dual focus on philanthropic leadership among Hamilton’s women, and improving the lives of women and girls in this community, is central to how grants are made and how the contributors are engaged throughout the year. By joining together in these efforts we can create greater impact and work toward our goal of making a difference. Women are underrepresented among Hamilton’s elected officials, at the highest levels of local public sector institutions as well as in the private sector. Read the full research paper to learn more. The Social Planning and Research Council of Hamilton produced the 2010 Women in Poverty report, that may also be of interest along with this report from the Girls Action Foundation. Subsequent studies commissioned by W4C have focused on Women’s Philanthropy and STEM: Challenges and Opportunities. Grants will be made to organizations whose goals match those of the Women 4 Change fund at Hamilton Community Foundation. There will be an annual program of education and other events that all contributors will be invited to attend. The first will be an educational event addressing topics related to improving the lives of women and girls in Hamilton. The second event will share the stories of the organizations and people who are benefiting from the grants. Additional opportunities for involvement may be presented to contributors from time to time as appropriate. To learn more please contact Sheree Meredith at Hamilton Community Foundation or call 905-523-5600.